My family celebrates major milestones by going to steakhouses and ordering as though we'll never eat again. Over the past decade or so, we’ve been especially lucky: I’ve sung "Happy Birthday" to my brother at Peter Luger Steak House and the Palm in New York City, where I live. I’ve toasted my parents’ wedding anniversary at the Precinct in my hometown of Cincinnati, Ohio. I marked my college graduation at Gibsons in Chicago and my sister’s at St. Elmo in Indianapolis. To me, a gluttonous steak dinner with salads smothered in blue cheese dressing, loaded baked potatoes and bottles of red wine signifies that life is good. I've always assumed that celebrities do not eat like this, even on happy occasions, and that's how they stay so slim. After all, life is full of trade-offs. But after Beyoncé showed up to the Met Gala looking like this, I admit, I was curious: How can a human being look like that? What does someone have to do to achieve that kind of body? Here's the answer: She has worked with exercise physiologist Marco Borges for years and even penned the forward to his new book, “The 22-Day Revolution.” Borges advocates for a plant-based diet and believes that if it takes 21 days to change a habit, devotees need to go vegan and alcohol-free for 22 days. He also suggests avoiding soy and gluten. It's restrictive, yes, but according to Beyoncé, who launched a prepared food line with Borges earlier this year, it works. So, in the name of journalism -- and swimsuit season -- I agreed to give it a whirl. I quickly learned the DIY route wasn’t cheap either. I forked over $200 during my first trip to the grocery store. Among my purchases were a $9 jar of almond butter and an equally expensive tin of tahini that remains unopened. Borges recommends organic produce for the “dirty dozen," including apples, cherry tomatoes, and bell peppers, and while I balked at the $14 organic grapes, I mostly complied. This is half-true. At first I did feel deprived and I did hate food. Most of all, I hated myself for agreeing to do this experiment. Who did I think I was? Without a moral leg to stand on, it felt overwhelming. What vegan wears leather?! "Beyoncé is a liar," I declared to anybody who would listen. The problem for me was the pressure to follow the meal plan outlined in the book. There was no way that I could balance my career, a social life and my other obligations with cooking dinner, preparing breakfast and whipping up lunch to bring to the office all at once. I nearly threw the book across the room when one lunch recipe required homemade cashew cheese. Side note: You’re also supposed to work out every day, rotating cardio and stretching with resistance training. Good luck with all of that. I vented to my friend Tracey Lemle, a certified health coach who runs Kale with a Side of Fries. One way to approach it, she suggested, was to think about what I wanted to eat and find a recipe in the book that would satisfy that craving. Stick to the tenets of the diet, but make it work for you, she said. This is supposed to be fun. It may have been a violation of the rules, but it helped: If I wanted Mexican, there were walnut tacos. (One friend declared that they looked like "a nightmare," but I loved them.) Thai? Vegetable curry. Italian? Gluten-free pasta. The trick involved eating making lunch the heartiest meal -- a challenge for someone like me, who tends to make salads a side at dinner rather than the main event. Still, things improved dramatically once I let myself relax, and the weight kept falling off anyway. Previously a cereal devotee, I loved the breakfasts most of all, especially granola (instead of making my own, I splurged on Early Bird's Jubilee brand), almond butter on toast with berries, and juices, which I made at home. 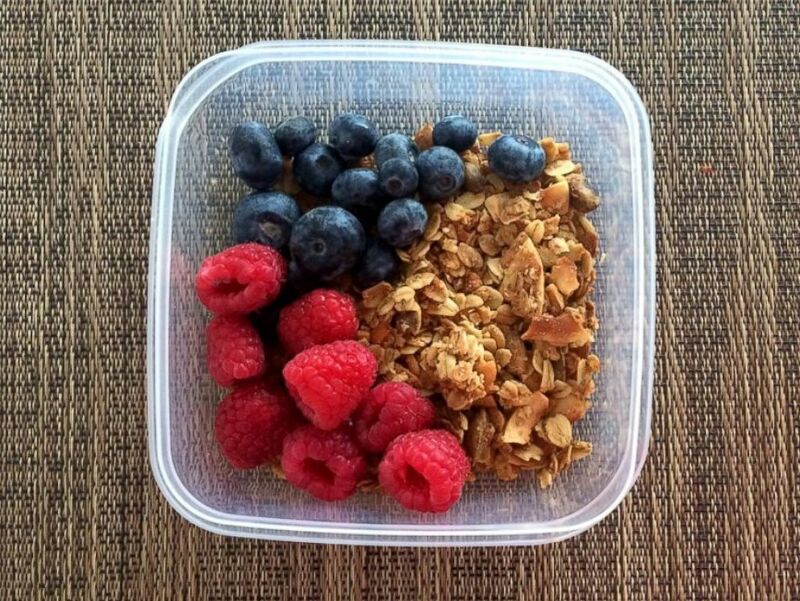 Early Bird granola with berries. 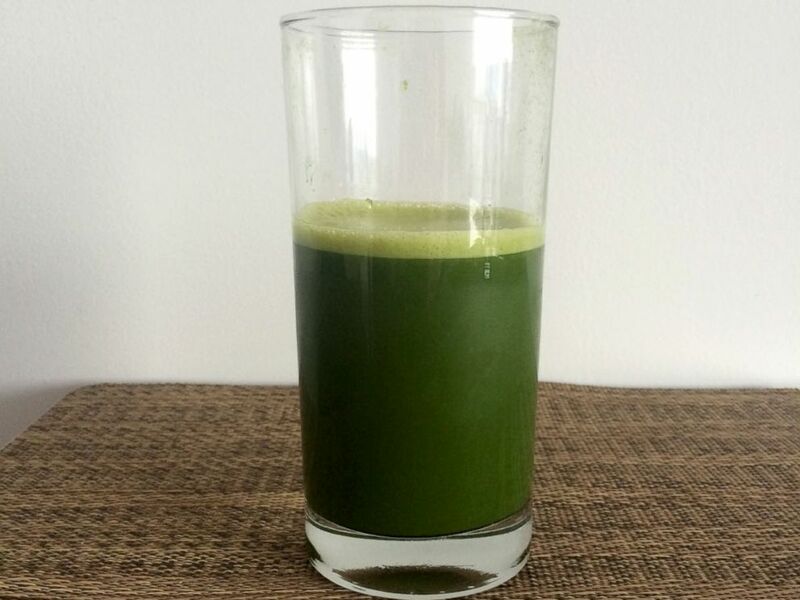 Juice with kale, spinach, apple and pineapple. As the days wore on, I enjoyed cooking the meals even more, and now that I was exercising portion control, I often had leftovers. 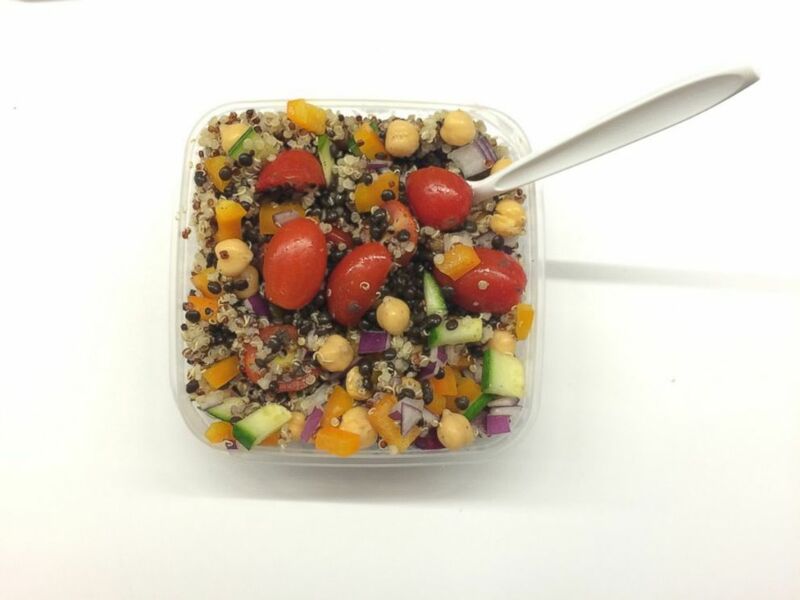 Extra quinoa made for great salads. 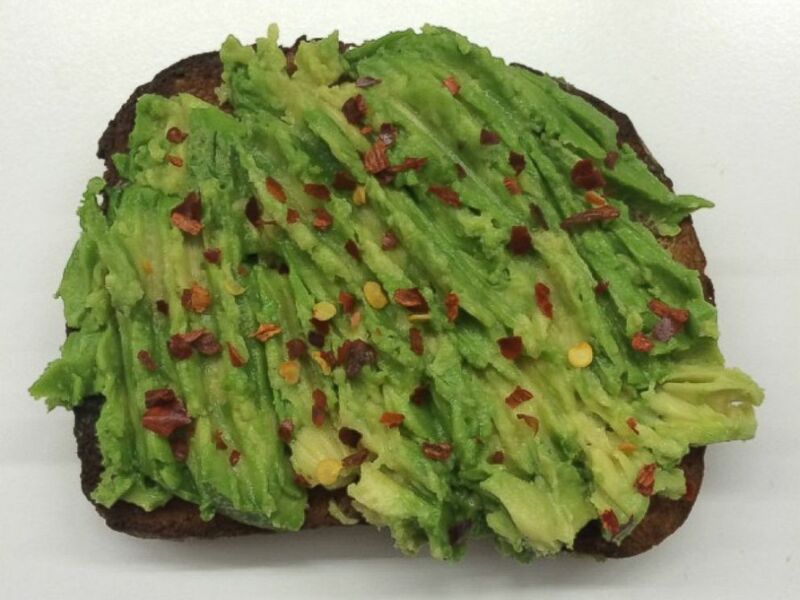 Too much avocado led to next day's avocado toast with red pepper flakes. The best part was, I was usually pretty full after the meals, and was rarely tempted to snack. Going to restaurants proved to be a bit trickier. I quickly discovered that seemingly vegan options are often made with egg or butter, and that lentils get boring very quickly. Celebrations changed too. At one birthday dinner early on, I nearly ripped off the face of the woman next to me who tore into fried chicken while I picked at a grain bowl. On the upside though, I found myself ordering things that I never would have chosen before (carob torte, anyone?) and actually liked them. I even checked out a few all-vegan restaurants, and, much to my surprise, really enjoyed everything I ate. Did I want to wash it down with a glass of Sauvignon blanc? Yes, but I discovered a new love of seltzer in the meantime. This is accurate for the most part. I steadily lost eight pounds, but almost immediately felt lighter and more confident. While I never had meat, dairy or alcohol over the course of the 22 days, there were times that I pushed the limits of the diet a bit (i.e, injera bread at an Ethiopian restaurant). When I did, I immediately sensed a difference in my body -- and not in a good way. Suddenly, I didn't want to cheat. People have asked me if I had increased energy while on this meal plan, and the truth is, I have no idea. All signs point to yes though: I slept well and I hit the gym more often than usual. My digestion improved, my skin looked great and I have to admit, I was proud of myself for sticking to this thing. I never realized I could be so disciplined. She's right, but "just trying it" isn't as easy as it sounds. It's not fun to always pass on junk food, at least a few of your friends will treat you like a buzzkill and you will get frustrated at times. After all, a non-vegan diet is ingrained in our culture and many social events seem to involve cocktails. But if you're open to trying something new, even temporarily, there are tremendous benefits. I used to think that eating should always be fun, and that looking at food as fuel was boring. Now that I know how much better it feels to balance the two, I can't imagine fully retreating to my old mindset. While I don't think this is a diet I could religiously stick with forever, I do think it'll force me to think twice about what I'm putting into my body and why I'm doing it. Plus, it's tough not to start to consider where your food is coming from and the way it got to your plate. Soon enough, I'll face the ultimate test: My family is going to a steakhouse to celebrate my father's birthday later this month. I can't say that I won't have a bite of a New York strip, but I won't eat myself into oblivion either.